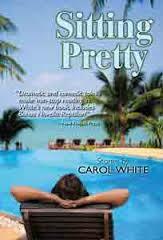 Carol White’s Sitting Pretty is more than just a collection of stories; it is an experience. In each story, the reader steps into the life of a character with a unique and vastly different perspective than the others in this collection. The organization of these stories (Rural Stories, Hers, His, Extras, End Story, and Bonus Novella) allows the reader to savor the book from beginning to end or choose which section they want to dive into. Comprised of twenty short stories and one novella, Sitting Pretty has a story for everyone-expect to be delighted, frightened, enlightened, and surprised. From rural areas of the country to Park Avenue and Boca Raton, Carol White’s Sitting Pretty includes stories of romance, mystery, suspense, friendship, betrayal, family, food, and fantasy. Open this book to any section you choose and when you eventually put it down, you’ll feel so close to these characters that you’ll believe that you know them. This was my first book from the author, Carol White and it will by no means be my last. Whilst as a general rule, I’m not a lover of short stories – this collection by Ms White was a thoroughly entertaining read. Each story is unique and stands alone, the characters are well-constructed and in many cases, found a place in my heart almost immediately. This is not always easy to do with a short story, where the action is fast-paced and there is only a minimal period of time to round out the characters. In each case, Ms. White has provided a unique story which was entertaining and in some cases, quite thought provoking. I particularly liked the novelette ‘Reptilian’ which is included with the book. I would recommend this book to… well, pretty much everyone – there’s something to please most readers and I never once had the impression of repetitivity with Ms. White’s writing. Each short story stands well alone and it was a pleasure to read. Highly recommended. Dear Ms. Williams: Thank you so much for featuring my book, “Sitting Pretty” and for your glowing review. I am very appreciative. All the best to you.